Real estate listings and sales through Mark Kozak at Century 21 Foothills Real Estate in Lethbridge, Alberta, Canada. Did you know that you can earn AIR MILES Reward Miles when you buy or sell a home through Mark Kozak at Century 21 Foothills Real Estate? 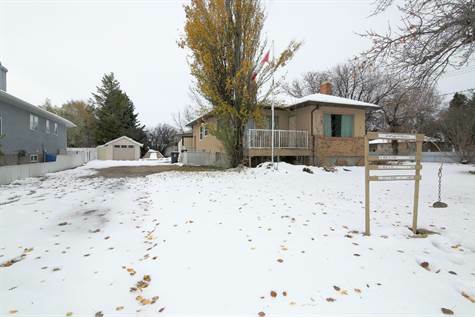 Raymond, Lethbridge Area - Nestled on a corner lot across from the Elementary school in Raymond you will find this spacious bungalow. With over 1,400 sq ft on the main floor and a full basement you have plenty of room to get started. The oak kitchen leads way to the open dining room and large front living room. Lots of natural light comes thru with the big windows. There are 2 bedrooms up stairs with an office as well and one more in the basement. Outside, the yard can be accessed from two sides so you have lots of options for parking an RV or the vehicle in the single car garage. Call Mark Kozak of Century 21 Foothills Real Estate for your chance to view and own this home. Ask how you can earn AIR MILES® Reward Miles when you buy or sell with Century 21.